During World War II the United States had a shortage of labor. 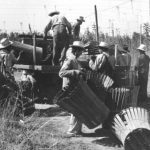 In response, the government imported ‘braceros’ or workers from Mexico. On average, 200,000 Mexican workers per year were brought to the US between 1942 to 1964. Seattle University Modern Languages and Women Studies Professor and Director of Latin American Studies, Dr. Gabriella Gutiérrez y Muhs, reflects on some of the stories of her family members who arrived her as braceros with KBCS’s Yuko Kodama.